Blogging is turning out to be an incredible resource for educating people, but at the same time, it can earn a considerable amount of money as well. Apart from writers and internet marketers, many brands and multinational companies have created their blogs to quench the thirst of your their audiences. However, there are still hundreds of people who are having a lot of blogging misconceptions, especially newbies. According to them, blogging is yet another charming way that can be a tangible bridge to grab millions of dollars in a month. It is hundred percent correct that blogging has got that much charm. But, it solely depends on your approach, how you pick your niche, content marketing strategies, blog promotion, etc. Being a Senior Blogger and Digital Marketing Expert, I know one thing very clear that nothing happens overnight. You need to put your best efforts to transform your dreams into a big reality. It requires time, patience and hard work to earn online. Therefore, I have decided to narrow down some of the most prominent misconceptions majority of newbies and even professionals have about blogging. I am pretty sure that after reading this blog post, you will start your blogging journey with a new and innovative mindset. It is one of the biggest blogging misunderstandings that ruin the entire blogging experience of a person. It doesn’t matter if you are an expert in English, but if you are not writing what your audience wants to read, you will end up with nothing. Today in this massive competition, bloggers have taken their efforts of satisfying readers to a whole new level. And, to be honest, it should be your approach as well. Remember, your blog’s loyal visitors will become your strength. So, it is extremely important for you to treat them like an asset. For this, you will have to write the type of content that can actually help your readers make strong and mature decisions. If Everyone Is Doing It, Then Why Not Me? If one of your friends is a serious blogger, then instead of copying him, follow the techniques he has adopted to take his blog to the sky. I have seen a lot of people who started their blogs because they have got inspired by other bloggers. I know that getting inspired is a good thing, but copying someone else to chase your own dreams is not at all a sensible approach. If you want to start your blogging journey with a bang, then it is crucial for you to be passionate about it. With this way, you definitely will be able to accomplish your ultimate goals. Believe me or not, but following someone else, too much will take you nowhere. You just learn strategies from professional bloggers how they create content, promotion techniques and the way they blog, and after that, implement those techniques with your own strategies. You have to do something different from others to build a loyal audience and authority in your niche. It is due to the reason I would suggest you to stop thinking about starting a blog if you are not passionate about it. It sounds like a selfish guy who only wants to fulfill his dreams by using others as a source to make money online without providing valuable stuff. And it is another one of big blogging misconceptions that you will realize when you start a blog. Honestly, I had a tough time when I started my first blog back in 2009. But, I didn’t give up because money was not the only priority. All I wanted to share my experiences, guidelines and tips with my audience. And, I think it is just because of this reason I have managed to convert my blog’s traffic from hundreds to millions. The reason for sharing this little and real-life story is obvious. If you want to cash your audience, you should give them a solid respect. Trust me it is a proven way that can make you an authority blogger within your niche in just a short span of time. Write what you are good at and what your audience wants to read. Instead of covering every single niche to grab a great number of audiences from all across the world, keep focused toward a single niche and implement every possible idea that can help you convert a random visitor to a potential lead. Many great and influencing bloggers like Neil Patel, Jeff Bullas, and Christi Hines cover a single domain, but in an effective way. Similarly, you should not invest your time in something that can’t show you a positive path. It is a very positive approach that can earn you a reputable name in the world of blogging, but only if you are implementing the right techniques. For this, you will first have to understand the behavior, preference, and attitude of your prospects. As this way, introducing new and innovative ideas will be a lot easier for you. Let me tell you one thing very openly. A prospect always likes to see what he really wants. If you are introducing him with anything that is not of his interest, he will refuse to consider your blog in future. However, if a prospect is getting answers to all his questions from your blog, half of the work will be done from here. So yes, come up with great post ideas, but keep your audience in mind before implementing them. Gone are the days when internet marketers used to adopt this technique to market their brands and services. But, things have changed quite dramatically, especially when it comes to blogging. Today, if you are only talking about yourself, no one will ever make any effort to listen to you. Therefore, if you want to be known as a famous blogger, you need to be a source of satisfaction for your readers. With this, I clearly mean that you should maintain a fair balance between promotion and satisfaction. If people are coming to your blog quite frequently, they will not mind taking decisive actions against your promotional activities as well. 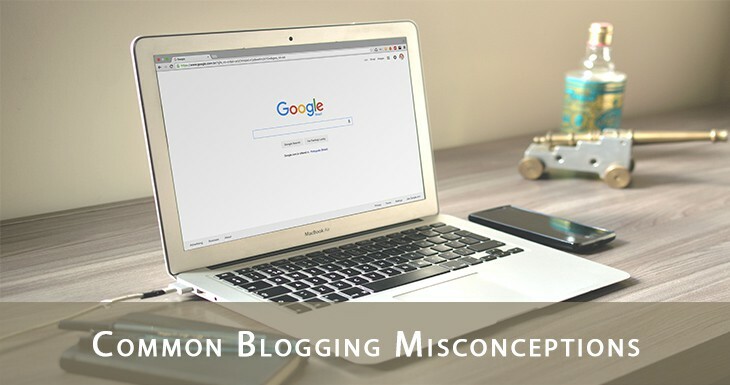 I hope that you will get a lot of help from this particular common blogging misconceptions post to revamp your blogging approach from now onwards. Just Keep one thing in mind, if you love what you are doing, you will find plenty of ways to bring perfection to your work. If blogging is just fun for you and not serious about becoming a pro-blogger, then keep doing it as you want. But to achieve your goals and making significant money online with blogging, you have to stick with consistent homework which is essential to building a great blog. Anna Pike is a Senior Blogger and Digital Marketing Strategist at Essay Service firm in the United Kingdom. She likes to read blogs and Digital Marketing new strategist whenever she is not working, and she likes to play chess with her son.